1895 (March 27): John Baptist Greco was born in Waterbury, CT. Shortly after his birth, the Greco family moved to their home country of Italy. Circa 1908: The Greco family returned to Waterbury. Greco briefly attended seminary after high school. He went on to graduate from Yale School of Law and opened a practice in Waterbury. 1934: Greco formed a chapter of the Catholic Campaigners for Christ and began to preach up and down the east coast. Early 1950’s: Greco envisioned a roadside theme park devoted to God. 1957: Holy Land USA opened to the public. 1960’s: Holy Land USA began to receive an estimated 40,000 visitors per year. 1984: Holy Land USA closed to the public. 1986 (March 12): Greco died at the age of ninety. Ownership of Holy Land, USA was passed on to the Religious Sisters of Fillipini. 2008 (June 18): A new, fifty-foot cross was erected in the park. 2010: Sixteen year-old Chloe Ottman was found raped and murdered in the unused park. 2013: Waterbury Mayor Neil O’Leary and Fred “Fritz” Blasius purchased the land housing the former Holy Land USA from the Religious Sisters Fillipini and began plans to restore the park. John Baptist Greco was born on March 27, 1895 in Waterbury, Connecticut to Italian immigrants Raffaela and Vincenzo Greco (Gannaway 2008). Possibly due to economic hardship in the late 1890’s, the Greco family returned to Torelli dei Lombardi, Avellino in Southern Italy and remained there until relocating back to Waterbury when John was thirteen. After graduating from high school, Greco briefly attended seminary at Catholic University in Washington, D.C. but left before receiving a diploma due to health reasons. He eventually graduated from Yale School of Law. Greco then opened a practice in Waterbury in 1926, where he continued to work for several decades. He often provided services at low to no cost to fellow Italian immigrants and disadvantaged members of the community (Bremer 2008). A devout Catholic, Greco formed a chapter of Catholic Campaigners for Christ in 1934. Through this group, he frequently visited towns and cities up and down the east coast sharing his Christian faith with passersby. In addition, Greco often sermonized and recited the rosary on a local radio station (Bremer 2008). Through Greco’s life, he and his family were members of the Our Lady of Lourdes, a Catholic church established to serve families of Italian descent in Waterbury. In the late 1940’s to early 1950’s, John Greco and friend Anthony Coviello began a movement in the Waterbury area to “put Christ back into Christmas.” During this time, he and Coviello were constructing nativities for the town and neighboring areas. This expression of spirituality was not unusual. As Gannaway (2008:30) notes: “Back home in Italy each village had its own saint to celebrate. In this country Italian-American honored saints by creating statuary, grottos, nativity scenes, and passion plays they displayed at mass, at festivals, and at their homes.” Out of these experiences the idea for the future Holy Land USA occurred to Greco. It is possible that he was specifically inspired to create Holy Land by the Italian sacri monti or “sacred mountains” that were popular in Italy beginning in the sixteenth century, which served as substitute holy sites for pilgrims unable to make a journey to the Holy Land itself (Zielbauer 2001). Soon after conceiving the Holy Land idea (originally called “Bethlehem Village”), Greco purchased a craggy seventeen-acre plot of land called Pine Hill. With the help of friends, neighbors, and the Catholic Campaigners for Christ lay group, the construction of a large cross meant to stand atop the hill began. The 32-foot “Peace Cross” was erected and dedicated in 1956. 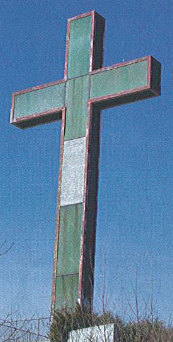 Over 1,000 townspeople attended the dedication of the cross, whose green and red lights stood for hope and unity in response to the foreign threat of communism. Both Italian and Irish Catholics took part in assembly of the cross, an uncommon occurrence in 1950’s Waterbury. The Peace Cross signified a town coming together to join both American and Christian principles to promote peace, equality and justice (Gannaway 2008). After the Peace Cross was dedicated, work began on what would soon become a popular Connecticut attraction. Using mostly donated items such as bathtubs, appliances, and scrap metal, along with cement, clay, and bricks, Greco and hundreds of volunteers worked in the evenings and on weekends to assemble artistic representations of Bible stories. Often reminiscent of the yard shrines built by Italian Americans, these rustic dioramas depicted such scenes as Christ’s birth, the crucifixion, and life in Jerusalem. In planning the scenes, Greco and his partners used maps, the Bible, and photographs in order to create more accurate representations of historic and biblical events. At one point, Greco even visited the Holy Land itself and brought back soil and rocks to add to the park (Gannaway 2008). On December 11, 1958, Holy Land USA was opened to the public under the name “Bethlehem Village” (Gannaway 2008). 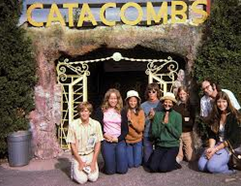 It soon became a popular destination for church groups and families. In order to attract a wider audience and appeal to travelers, a gift shop and refreshment stand were opened. 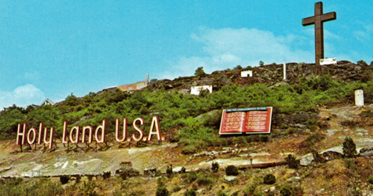 Greco also installed a large sign reminiscent of one that sits along the Hollywood Hills reading “Holy Land.” At its height in the 1960’s, Holy Land featured 200 small buildings on its seventeen-acre site and attracted upwards of 40,000 visitors each year (Waterbury Hall of Fame n.d.). Meanwhile, Greco continued to practice law and give tours of the park to visitors. A lifelong bachelor, he spent his spare time devoted to the maintenance of his creation. As John Baptist Greco began to age, two nuns were appointed by the local diocese to assist him in maintaining the park. The nuns, who lived in a convent run by the Religious Sisters Fillipini situated just outside of Holy Land, eventually went on to provide caretaking duties for Greco as his health declined. As Greco’s physical state weakened, the park went into disrepair and eventually closed its doors to the public in 1984. Greco died two years later and willed Pine Hill and Holy Land to the Sisters. It has remained closed ever since and decays further every year. Over the past several decades, there have been quite a few initiatives to restore the park to its former glory both by religious groups and citizens wishing to preserve Holy Land’s folk art value, but so far, none have followed through. The cross that sits atop Pine Hill has been replaced twice, the most recent having been erected in December 2013 (Wenzel and Konopka 2013). Also in 2013, the land housing the ruins of the park was purchased from the Sisters by the mayor of Waterbury and his business partner, who have vowed to restore the park. John Baptist Greco’s devout Roman Catholic beliefs served as the imagination behind the displays within Holy Land. The original goal of the park was to illuminate the Bible so that non-believers and Christians alike might gain a better understanding of their faith. Christian symbols, some of particular interest to Catholics, thematize the exhibits at the park. These included the Garden of Eden, Catacombs depicting Christian martyrs throughout history, The Stations of the Cross, Herod’s palace, Daniel in the lion’s den, and the City of Jerusalem. Greco also saw social justice as an important part of the Christian faith. Before opening the park, Greco and friend Anthony Coviello marched in a Waterbury parade with the Catholic Campaigners for Christ with a banner that read “Segregation is Unamerican, Unchristian, and Ungodly,” a demonstration of their feelings toward the social inequality of the 1950’s. Greco and friends aimed to emphasize equality of all mankind through inscriptions on tablets around the park. One such stone notes that “We are all the Body of Christ. If one member suffers, we all suffer” (Gannaway 2008). the deteriorating park from 1986 to 2013, although they did not do much in the way of restoration during this time, aside from removing several relics and preserving them in a nearby chapel basement. Pine Hill and the remnants of Holy Land are now owned by Waterbury Mayor Neil O’Leary and partner Fred “Fritz” Blasius, who have announced a plan to restore the park. Holy Land received unfavorable press in 2008 when the body of sixteen year-old Chloe Ottman was found in the park. Ottman had been raped and murdered at the foot of the Peace Cross by a young man in her high school, who was subsequently tried and sentenced to fifty-five years in prison (Dempsey 2011). Although there has been interest in restoring the park in the years since its’ closing, there have been no groups that have actually followed through on their publicly stated intentions. As the park is currently not secured from trespassers, vandals have contributed to the destruction of the park, defacing and destroying many of the exhibits. Nature has also taken over much of the area so that it barely resembles what it once was. While the park still receives visitors, they now must walk past “no trespassing” signs and enter at their own risk. Until a restoration takes place, Holy Land will serve as an offbeat tourist attraction to a few, tacky eyesore to some, and a pleasant reminder of times gone by to others. Bremer, Jennifer. 2008. “Holy Land USA.” American Road , Autumn, Pp. 46–48. Accessed from http://www.flickr.com/photos/roadtripmemories/6030069312/in/set-72157603616821181/ on 17 March 2014. Dempsey, Christine. 2011. “Waterbury Man Sentenced to 55 years in Holy Land Murder.” The Courant, June 17. Accessed from http://articles.courant.com/2011-06-17/community/hc-waterbury-holy-land-sentenced-061820110617_1_chloe-ottman-francisco-cruz-friend on 17 March 2014. Gannaway, Wayne. 2008. “Pilgrimage to Waterbury.” Hog River Journal, Summer. Accessed from http://www.wku.edu/folkstudies/a_pilgrimage_to_waterbury.pdf on 17 March 2014. Waterbury Hall of Fame. n.d. “John Greco.” Waterbury Hall of Fame. Accessed from http://www.bronsonlibrary.org/filestorage/33/Greco2000.jpg on 17 March 2014. Wenzel, Joseph and Konopka, Jill. 2013. “New Cross Installed at Holy Land in Waterbury.” WFSB, December 19. Accessed from http://www.wfsb.com/story/24264956/new-cross-installed-at-holy-land-in-waterbury on 17 March 2014. Zielbauer, Paul. 2001. “A Sight That Inspires Ambivalence; Ruins of a Religious Park Await Restorers or the Bulldozer.” The New York Times , November 12. Accessed from http://www.nytimes.com/2002/11/12/nyregion/sight-that-inspires-ambivalence-ruins-religious-park-await-restorers-bulldozer.html on 17 March 2014.